One of the features of the mammalian brain is a structure called the hippocampus. Since the brain is split in half, every mammal has two hippocampi, one on each side, as illustrated in the drawings of the human brain above. These structures are very important for the formation of memories as well as spatial navigation. The reason I am telling you all this is because an incredibly interesting study was just published in the journal Cell, and it uses the aftereffects of the atomic bombs (both their use and testing) to pin down the specifics of how many new brain cells people make in their hippocampi throughout their adult life. In mammals, although not in many other vertebrates, central nervous system neurons have an important peculiarity; they do not divide after a time roughly coinciding with birth. When a neuron dies, it is not replaced. All the neurons you will ever have were formed by the time you were six months old. We now know that such statements are incorrect. In a variety of mammals that have been studied, adults produce new neurons in the olfactory bulb (a part of the brain used in the sense of smell) and the hippocampus.3 This new study uses a technique that shows adult humans produce a significant number of new neurons in their hippocampi, but they probably don’t produce new neurons in their olfactory bulbs. When it comes to studying how adult animals produce new neurons (a process now known as neurogenesis), scientists are able to do all sorts of invasive procedures that can’t ethically be done on human beings. As a result, determining the details about human neurogenesis has been much more difficult. However, a team of scientists decided to do something very creative: they used atomic bombs as an indicator of cell age! How did they do that? Well, from 1945 to 1963, the use and testing of atomic bombs significantly increased the amount of carbon-14 (a radioactive isotope of carbon) in the atmosphere. However, after the Limited Test Ban Treaty of 1963, most above-ground tests of atomic bombs ceased. As a result, the amount of carbon-14 in the atmosphere has been decreasing. Now please note that this decrease is not because of the radioactive decay of carbon-14. That process is too slow to produce a significant change in the past 50-60 years. The decrease has occurred because carbon-14 is being taken out of the atmosphere by living organisms. Notice how well the carbon-14 content of the cell’s DNA (the red dots) track the carbon-14 content of the atmosphere (the black line). 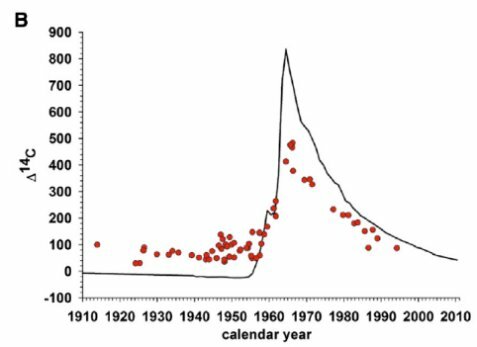 Because of this nice correlation, the authors were able to use the carbon-14 content in any cell’s DNA to determine the year in which it was produced! In the study, the authors took brain cells from people who had died. Using this technique, they showed (in a previous study5) that the cells in the olfactory bulbs were produced roughly when the person was born. As a result, they concluded that unlike most mammals, people do not produce new neurons in their olfactory bulbs. However, in the current study (reference 4), they showed that many of the neurons in the hippocampi were much younger than the individuals from whom the cells were taken. As a result, they conclude that people do produce new neurons in their hippocampi throughout their lives. We conclude that neurons are generated throughout adulthood and that the rates are comparable in middle-aged humans and mice, suggesting that adult hippocampal neurogenesis may contribute to human brain function. So this technique shows that there is little adult neurogenesis in the human olfactory bulb (unlike we see in most mammals), but a lot of adult neurogenesis in the human hippocampus. Most likely, these new neurons are important to the function of the hippocampus, and the fact that neurogenesis is so rapid in people compared to other mammals (like mice) is probably related to the fact that people have higher cognitive abilities. In addition, the sense of smell is not as important to people as it is to many other mammals, and that’s probably why other mammals produce new neurons in their olfactory bulbs but people do not. It will be interesting to see what further studies tell us about adult neurogenesis!